The multi skilled staff team at ASF allows us to undertake projects across a full range of scale and complexity. From one off utility products to integrated and dynamic schemes, we always aim to provide quality and service at the right price. 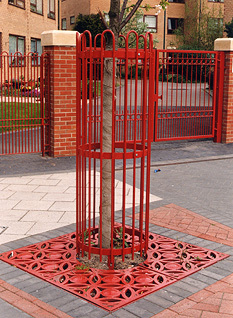 Attractive and stylish, ASF's range of Cast Iron Tree Grilles give a combination of style and practicality. 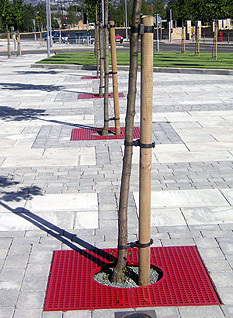 Allowing irrigation whilst protecting the roots, ASF Tree Grilles look great as stand alone features or as part of a paving scheme. ASF can manufacture Grilles either with or without dedicated irrigation holes for root watering systems. Being part of the WB White group of companies means that ASF have access to a wide range of manufacturing resources. One of the sister companies is SG Castings - a foundry specialising in manufacturing castings in SG, or Spheroidal Graphite cast iron. Spheroidal Graphite cast iron has undergone a transformation in the melting process that alters its molecular structure, increasing the iron's ability to withstand impact - it literally has more ductility. For this reason SG iron is often referred to as ductile iron. 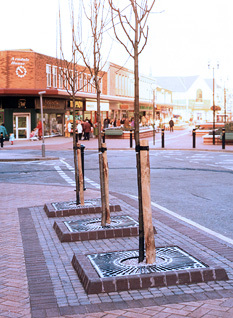 ASF's complete range of cast iron tree grilles are available in all grades of ductile iron. This is particularly important where there is a risk of vehicular overpass. ASF can supply ductile iron products with full certificates of conformity, and if required can produce items to meet structural requirements. 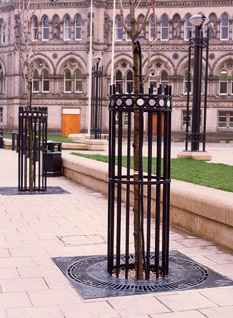 Designed to complement the ASF Tree Grilles, these guards are a great looking way to increase vandal resistance or to complement architectural schemes. Click here for PDF's of steel and stainless steel tree grilles. ASF manufacture tree grilles designed to be retro filled with resibond on site. This material forms a tough yet porous surface ideal for tree surrounds in urban and rural schemes alike. The grilles are manufactured in mild steel and are fully galvanised. They can be manufactured in stainless steel if required. As with all ASF Grilles, the inner trays or grille sections are fastened with security fixings and are fully removable allowing the tree to be removed and replaced if required. Click here for PDF's of ASF Resi-bond Tree Grilles.. The MaxPave is a stylish and practical tree grille with the urban setting in mind. 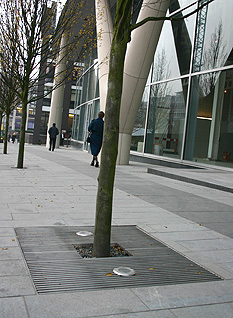 The design allows paving to be continued almost up to the tree trunk itself whilst allowing rainwater through to maximise irrigation. 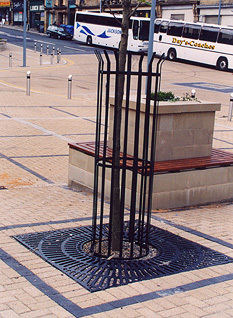 As a standard item, the MaxPave Tree Grille is ideal for use with block paving, but dimensions of the inner trays can be altered to suit other paving styles. Click here for PDF's of ASF MaxPave Tree Grilles..
All ASF Tree Grilles, regardless of material and style, can be manufactured to work in conjunction with root irrigation systems. ASF are happy to supply these alongside grilles if required.